NewsCred: Just How Trustworthy is Your Favorite Blog? The internet is littered with people who don’t know what they’re talking about. Common sense is usually enough to separate the junk from legitimate articles, but even the most highly-regarded publications have been infiltrated by reporters who like to make things up. NewsCred, an international startup based out of Geneva and Stockholm, is trying to address this problem by assigning a credibility rating to every big-name publisher, author, and story. The site is currently in a private alpha, and you can grab one of 1000 invites here. Right now NewsCred behaves like a mix between a news aggregator and Digg. Users can pick from a number of major news sources to customize their main feeds, or they can sort sources by credibility. 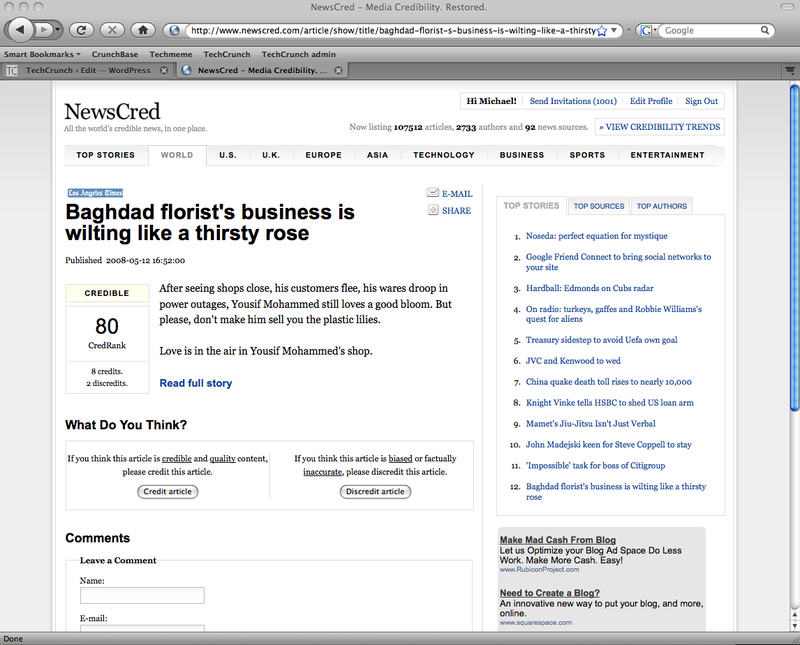 After clicking on a story, users can choose to either “Credit” or “Discredit” the author or the article itself. These ratings are averaged across all users to determine the trustworthiness of each article, author, and publication. NewsCred’s biggest problem is going to involve establishing a meaningful reputation system dictated by “the crowd”. For one, the obvious issue of bias comes into play – there will be no shortage of people who discredit sources for simply disagreeing with them. Most people will respond to a story with a gut instinct of, “This seems stupid” instead of, “The facts presented in this article are false”. The system also fails to take into account the nature of breaking news. The “most credible” source might be the one that sits on the sidelines for a few days while everyone else is talking to contacts and searching for facts. Rumormongers have no business being called “credible”, but there is something to be said for sources that break stories first. NewsCred should reflect this somehow. NewsCred has a good idea. Both online blogs and the mainstream media are full of unsubstantiated rumors, biased articles, and unsourced facts. But a black-and-white voting system doesn’t seem to be the best way establish an author’s reputation – the system will rapidly devolve into little more than a popularity contest. In order to succeed, NewsCred will need to establish a robust rating system that encourages fact-based debate. Otherwise, it won’t have much credibility itself. The image above is supposed to show the trustworthiness of mainstream media over time, but there isn’t much data yet.